This study reports observations of basking sharks (Cetorhinus maximus) sighted during an offshore geophysical survey conducted in July and August 2013, west of Shetland, UK. During the 38-day survey, trained and dedicated marine wildlife observers recorded 19 sightings of basking sharks (n = 22 individuals). Of these observations, 17 were of single sharks, with one observation of two sharks and one observation of three sharks. All surface sightings occurred in water depths between 129 and 199 m, predominantly prior to noon local time (79%), and were mostly of sharks 6–8 m in length, although a young (2 m) individual was also recorded. Breaching behaviour was observed on 21 occasions, by individuals or in small groups. Breaching has been proposed as a male-male competitive behaviour during courtship displays and female basking sharks may breach to signal their readiness for mating. Aggregations of basking sharks at frontal systems are well documented and linked to the occurrence of prey patches; however, these oceanographic features may also be of importance to courtship. The high number of sightings of sharks recorded during a relatively short time frame in addition to breaching behaviour and presence of young individuals, suggest that this area west of Shetland may be an important habitat for the basking shark. The basking shark (Cetorhinus maximus) is the largest fish in UK waters and the second largest fish globally, reaching 12 m in length and weighing up to 4 t (Sims, 2008). Basking sharks have been shown to feed where water masses meet, such as at interfaces between bodies of water, including tidal and oceanic fronts, typically with strong thermal gradients (Sims, 2008; Priede & Miller, 2009). At these fronts, plankton are typically found in higher concentrations (Sims & Quayle, 1998). Basking sharks follow their prey horizontally and vertically, and are known to forage over large distances often observed singly, or in pairs, but can be also found in large groups (Wilson, 2004; Crowe et al., 2018). Sightings in the Northeast Atlantic are usually recorded between April and October, with the peak number of sightings between June and August (Witt et al., 2012). The European continental shelf is a particularly important habitat for basking sharks and although they can demonstrate acute site fidelity to coastal regions, movements can be widespread (Doherty et al., 2017a; Doherty et al., 2017b; Sims et al., 2003; Southall et al., 2006). In the northeast Atlantic area they are considered Endangered by the IUCN (Fowler, 2009). Basking sharks have been shown to travel long distances to locate aggregated zooplankton, that can occur at frontal systems that can form in continental shelf and shelf-edge habitats (Sims & Quayle, 1998; Sims et al., 2006). In shallow inner-shelf regions of the Northeast Atlantic, near thermal fronts, sharks have been known to exhibit reverse diel vertical migration (DVM), where they are typically near the surface during daylight hours. This is most likely due to the reverse DVM of basking sharks prey, Calanus sp. in the area (Sims et al., 2005). In the UK, high relative densities of surface sightings occur on the west coast of Scotland, around the Isle of Man and on the southwest coast of England (Witt et al., 2012; Speedie & Johnson, 2008; Speedie et al., 2009). There are two established hotspot sites in Scotland, which are the islands of Hyskeir and Canna situated in the Sea of the Hebrides, and the island of Coll (Gunna Sound, between Coll and Tiree) in the Inner Hebrides (Doherty et al., 2017a; Speedie et al., 2009). The Hyskeir and Canna hotspot support high numbers of sharks involved in putative courtship behaviour and is a site where breaching activity has been recorded (Speedie et al., 2009). The functional role of breaching has however yet to be resolved, but might involve intra-species communication to find mates or deter competing conspecifics for breeding opportunities (Sims et al., 2000). The occurrence and distribution of basking sharks to the west of the Shetland Islands (Fig. 1a; 60.5° N, 2.1° W), remains poorly understood with only few sightings documented in this region over the past 20 years (Witt et al., 2012). A paucity of data potentially reflects the remote nature of this island archipelago, but also that data from offshore regions is limited by reduced sightings effort and subsequent reporting to public recording programmes, such as those operated by the Marine Conservation Society (UK) and the Shark Trust (UK). This study reports upon the sighting of basking sharks breaching to the west of Shetland, observed during marine wildlife observations made during 2D seismic survey activity. Marine wildlife observations were conducted by experienced Marine Mammal Observers (MMOs) on an 80 m long seismic source vessel from July 2nd to August 9th 2013 in an area to the west of Shetland during hours of daylight. The survey route followed linear transects of between ~ 15 and ~ 25 km length travelling either in a south-east to north-west (and reciprocal) or south-west to north-east (and reciprocal) direction; approximate travel speed during line transects was 4 knots; and approximate distance between transects was 2.5 km (Fig. 1a). Observers stationed 11 m above water level surveyed 360 degrees of visible seascape first searching by the naked eye for visual cues followed by focused following using binoculars. Locations of basking shark sightings were determined from the vessel location on first detection along with information on the bearing (degrees; 0 to 360) and distance (m) to the sighting. Distance to sharks was estimated using a range finder (Heinemann 1981). Information on environmental conditions was recorded at either 60-min intervals or if weather or acoustic source activity changed. The observers recorded data on wind force (Beaufort scale; 0 to 12), sea state (glassy, slight, choppy, rough), visibility < 1 km, 1–5 km, > 5 km), sun glare (weak, strong, variable/forward, behind) and swell condition (< 2 m, 2–4 m, > 4 m). The instantaneous location of the survey vessel in decimal degree latitude and longitude (World Geodetic System, 1984) was determined by an on-board GPS (at 1-s interval) and were archived to retrospectively calculate spatial-temporal search effort. Survey location data (GPS) were transformed to Universal Traverse Mercator Zone 30 prior to analysis. 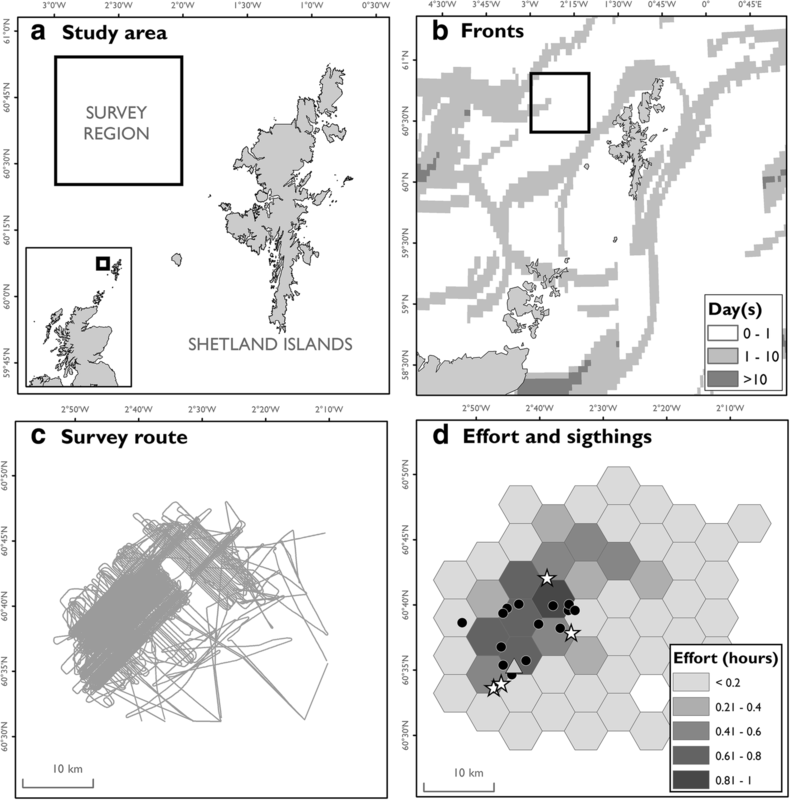 Survey effort was expressed as cumulative hours across the survey region using a grid (25 km2 cell area) to facilitate comparison with estimates of basking shark density (sharks h− 1; SPUE) on the west coast of Scotland (Speedie et al. 2009). Seismic survey airguns operated continuously during the survey period ceasing occasionally during line turns and periods of adverse weather conditions. Acoustic impulses were made by a source array, which consisted of four air gun elements (total volume 160 in.3). Cumulative presence of daily thermal fronts (0.5 °C threshold) for the study period (38 days) were calculated from GHRSST L4 daily surface temperature data using the MGET Cayula-Cornillon fronts detection algorithm (Roberts et al., 2010). During the survey period (July 2nd to August 9th 2013; n = 39 cumulative survey days), 19 sightings of basking sharks (n = 22 individuals) were recorded (Fig. 1). Weather conditions during this time were mostly favourable characterised with predominantly slight sea state (61%), low swell (76%), wind Beaufort force between 2 and 4 (79%) and visibility exceeding 5 km (63%). Effort-corrected basking shark density ranged from 0 to 0.75 sharks (mean: 0.05) per cumulative hour of survey across the survey region. Distance from the survey vessel to sighted sharks on first detection ranged from 30 m to 3 km (median 800 m, interquartile range 1450 m). Sightings ranged from momentary observations up to 24 min in duration (median 1 min., interquartile range 9 min.). Of the observations, 17 were of single sharks, with one observation of two sharks and one observation of three sharks within close proximity of each other. The survey was conducted in linear transects thus reducing the probability of double counting basking sharks, which could result in overestimation. Basking sharks were observed breaching clear of the water on 21 occasions (Fig. 2a). All sightings were in water depths ranging from 129 to 199 m. The majority of sightings (79%) and breaching events (95%) occurred prior to noon local time and were mostly of sharks approximately 6–8 m in length. Other observed behaviours were slow and directed swimming and surfacing (Figs. 1d and 2b). On one occasion an individual basking shark was sighted breaching three times in succession followed by another single breach approximately 20 min later. Two other basking sharks were sighted breaching twice on separate occasions, and a young basking shark (~ 2 m total length) was observed breaching after a nearby adult had breached. 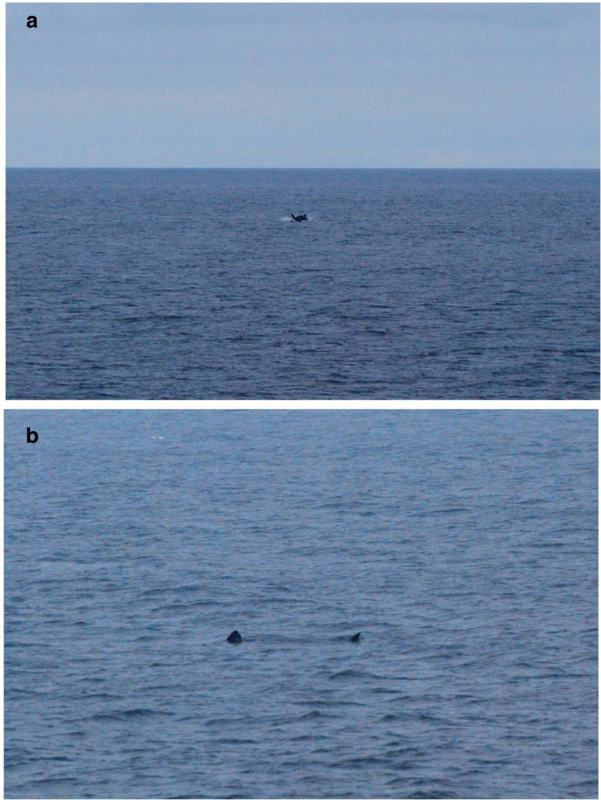 Breaching has been proposed as a male-male competitive behaviour during courtship displays and female basking sharks may breach to signal their readiness for mating (Sims et al., 2000). Basking sharks can aggregate in prey patches near fronts to feed, and as such this behaviour increases the likelihood of mature individuals meeting to initiate courtship (Sims et al., 2000). Frontal systems may therefore be oceanographic features of importance for feeding and for courtship. Should such breaching behaviour form part of courtship in the mating system of C. maximus then regions which support this behaviour may benefit from further research and enhanced wildlife management measures. Estimates of basking shark density for this survey are consistent with those from the west coast of Scotland, where Speedie et al. (2009) (Speedie & Johnson, 2008) reported densities ranging from 0 to 4.46 sharks per cumulative hour of survey. Although startle responses to acoustic sources have been recorded in some elasmobranch species, research in the behaviour of basking sharks and other elasmobranch species to seismic sources is poorly understood and yet to be investigated (Myrberg Jr et al., 1978; Carroll et al., 2016). This dataset is not of sufficient size to conduct a robust analysis and draw any conclusions on this issue. Taking into consideration the number of sightings of basking sharks recorded during this survey, the breaching behaviour, the presence of young individuals as well as the suitability of the region in terms of oceanographic features, it is possible to suggest that this area west of Shetland may be an important habitat for basking sharks. Given the limited nature of this dataset, it is highly recommended that additional studies are conducted in the area to support these findings. We thank BP for permission to use data collected during the west of Shetland seismic survey campaign and for endorsing the publication of this work. All data made accessible during this study are included in this published article. All authors contributed to data analysis and manuscript preparation. All authors read and approved the final manuscript. Permissions to conduct seismic surveying, from which this data resulted were acquired from relevant authorities by the data owners. Fowler SL. Cetorhinus maximus (Northeast Atlantic subpopulation). The IUCN Red List Threatened Species 2009. www.iucnredlist.org. Accessed 1 Jan 2018.